Tahoe-to-Yosemite on the Pacific Crest Trail (PCT) is a 150-mile route that starts at Echo Lakes and ends at Tuolumne Meadows in Yosemite. The start can begin in a number of different locations along the PCT in the Tahoe area, including Sierra City, Highway 80/Donner Pass (Truckee) or a number of trailheads in Desolation Wilderness. And since this is an arbitrary segment of the PCT, it could end anywhere you want in Yosemite or further south, which naturally affects the mileage. Some hikers end at Tuolumne Meadows, which is convenient due to the presence of a large parking lot and access to public transit. Others continue to Mammoth Lakes, Mt. Whitney or beyond. Since my route took me from Echo Lakes to Tuolumne Meadows, that will be the focus in this article. The trail undulates through terrain that is as varied, if not quite as dramatic as the John Muir Trail (JMT). There were masses of wildflowers, surreal geologic forms, ancient trees, plenty of river crossings, deep canyons and days when we were on top of the world. In general, the elevation is lower than the JMT with many campsites no higher than 10,000 feet. I found the first half, from Tahoe to Sonora Pass, to be slightly easier than the second half. Two days in Yosemite, in particular, were challenging due to excessive gains and losses in elevation. It was in this section where rivers can run dangerously high in early summer. SOUTHBOUND (SOBO): Before you can get a permit, you have to decide in which direction you want to travel, north or south, and which trailhead to use. Steve and I chose Echo Lakes because of the ease of access and permit acquisition. We’ve already hiked all over Desolation Wilderness so we didn’t feel the need to add that section, which would also add days to the route. We already felt maxed out with the amount of food we needed to carry for both sections and that contributed to our desire to limit the days. The U.S. Forest Service “Lake Tahoe Basin Management Unit” handles permits from Echo Lake. The process to go southbound is simple. There are no quotas as this has not been a hugely popular starting point. This is in contrast to any of the trailheads in Desolation Wilderness, which is one of the most popular wilderness areas in the U.S. To obtain a permit, call the TBMU at 530-543-2600 around 2-3 weeks before the start date and answer a few questions about your trip. You can either have the permit mailed to you or you may pick it up. They prefer not to issue permits far in advance due to frequent revisions and cancellations. NORTHBOUND (NOBO): To start in Yosemite, obtain a wilderness permit from Yosemite National Park for the Glen Aulin Trailhead in Tuolumne Meadows or Happy Isles in Yosemite Valley. Fax the reservation form 168 days before your hike per the schedule laid out in the Wilderness Permits Reservation Window. If you are on Facebook, join the Tahoe to Yosemite PCT Section Hikers Group. In the Files section is a “TTY PCT Permit FAQ” that addresses permit information for other trailhead locations. There are many trails in several jurisdictions. Permits are needed for the park or forest where the entry trailhead is located. Generally, only one wilderness permit is required but there are some nuances that can affect this. It’s always best to double check with the issuing agency and clearly state your entry and exit trailhead. A California Campfire Permit is required in many wilderness areas in California. After viewing a short video online and completing a quiz, the permit may be printed. There is no fee. The name is a little misleading as the permit is required to be able to use a backpacking stove and often, campfires are prohibited in summer. There are large parking lots at Echo Lakes and the Tuolumne Meadows Wilderness Center (either end of the hike) where vehicles may be left for extended periods of time. Public transportation, shuttles and taxi/rideshare services are available in South Lake Tahoe, the closest town to Echo Lakes. If you’re flying into Reno, you can take an airport shuttle to South Lake Tahoe and then take a bus and taxi to the trailhead. Getting from one end of the trail to the other takes some planning. We live in California, so I conned my friend into picking us up in Tuolumne Meadows, where we left our car. We prefer to have our car waiting at the end of the trail rather than the start. We stayed the night at the Lake View Lodge (retro charm) in Lee Vining, just outside of Yosemite on the east side. We ate at the best restaurant in town, the Whoa Nelli Deli at the Mobil station. The next day she drove us to Echo Lakes and dropped us off. This plan can be accomplished using a combination of public transportation (YARTS from Yosemite, ESTA north on Highway 395, Tahoe Transportation bus from Hwy 395 (Carson Valley) to South Lake Tahoe and taxi to the trail) but will take additional time. Paul of the East Side Sierra Shuttle can provide a custom quote for what you need. I’ve ridden with Paul for other routes and he’s reliable and dependable. I don’t recommend unlicensed, unregulated transportation services but if you’re comfortable with these, you can ask around on internet forums for suggestions. There are two potential areas of confusion that should be noted. First, there is a Tahoe-to-Yosemite Trail (TYT) that was partially built in 1916. People often confuse the TYT with the PCT section. This article is not about the TYT, which is further east. There is an out-of-print guidebook, The Tahoe Yosemite Trail (by Thomas Winnett), that you may be able to find if you are interested. The trail is no longer maintained and while it is possible to still spot some TYT signs in Desolation, the trail can be difficult to locate in others. People who enjoy route-finding as sport still hike the TYT, though the numbers are small. There is a separate Facebook Group called the Tahoe to Yosemite Trail Group. To differentiate the one I’m writing about, I’ll call it the TTY-PCT (Tahoe-to-Yosemite on the PCT). Second, another confusing name is a popular resupply spot, Kennedy Meadows Resort and Pack Station near the PCT around Sonora Pass and Kennedy Meadows Campground (and General Store) on the PCT south of Mt. Whitney in Tulare County. These are 300 miles apart so it’s important to know which is which if you are mailing a resupply package or making a reservation. They have slightly different names (noted above) which aids in research, though many hikers simply specify Kennedy Meadows North or Kennedy Meadows South in conversation. There are several resupply options but only one location, Sonora Pass Highway, that is convenient. At this location are two different services. Sonora Pass Resupply is a unique mobile service that can deliver your mailed resupply or products that you order through the website (or through the HikerBot app). Casey Cox has a wide variety of backpacker foods and other items, including freeze-dried meals, snacks, breakfast and lunch items. He also has a selection of fresh foods, including eggs, bacon, ground beef, tomato, onion and buns. He provides a burner from the back of his mobile rig and you can cook up your own fresh food on the spot. He parks at the Forest Service parking lot on the PCT that has a pit toilet and picnic tables. He provides electrical outlets for charging electronics and a large garbage can for your trail trash. It takes some coordination to plan resupply as he is not permitted to stay overnight but he can be reached by phone or email if you’re going to be delayed. If Casey has no reservations he won’t be there and his permit does not allow him to sell directly from his truck; supplies must be ordered ahead of time. We used Sonora Pass Resupply and enjoyed swapping stories with Casey most of the day. We carried eight days of food for each half of the trip. Kennedy Meadows Resort and Pack Station is a traditional resupply location, though it is not right on the trail. It is located ten miles away from where the PCT crosses Highway 108. Some people hitchhike, but if you walk, it’s probably one half or one full day of hiking to get there. They can provide a ride back to the trailhead. They have cabins and a restaurant. See Pacific Crest Trail Association links for information on resupplying in other locations. Bear canisters are required in Yosemite (a ranger in Yosemite asked to see our permit AND our bear canister near Seavey Pass). In the Forest Service sections, hanging is allowed. We are used to carrying the cans so we used them the whole way. Check each jurisdiction’s requirements if you are parsing your trip into small sections and want to be sure. The section of the PCT from Tahoe to Yosemite offers a challenging and rewarding two-week hike through the Sierra. See “Tahoe to Yosemite PCT Section-Itinerary, Maps and Apps” for our 15-day itinerary and other resources. For the Sonora Pass Resupply, did you use the “Mailed Resupply” or the “Direct Resupply” in order for him to deliver your order to the trail? We did both. We mailed a box and ordered fresh food that we cooked onsite during our “nero” day, bacon and eggs. We also ordered a couple of items from the store to supplement what we mailed. It worked out great. Great article on the route! I already have my route planned and permitted for 2018 or I would have considered to add on to my JMT NOBO. As-is I am hiking NOBO and jumping a plane at Fresno and continuing at the Bridge of Gods at OR/WA and head up to Manning Park in Canada. Cherry picking the PCT sections as it were. Thanks for the great article, perhaps next NOBO I continue on to Tahoe, seems like a nice route – the last photo was especially inviting!!! Thanks for this link Ings. In the early stages of planning a early September trip from Senora Pass to Yosemite. And was hoping you could point me in the right direction as to what permits I will need. I haven’t done this, but here is information from our FAQ in the Facebook group I referenced in the article. Permit is valid up to and including Yosemite (including the valley) but does not include Donohue Pass (to exit the park on the JMT/PCT). A separate permit from YNP is required to exit Donohue on the JMT/PCT. Reading TTY PCT Permit FAQ on the Facebook page, it sounds like the TTY-PCT permit from Desolation Wilderness include Donohue Pass (to exit the park on the JMT/PCT). Is that accurate? Hi Tom, That should be correct but rules change over time. When you get your permit from Desolation it will state your exit point and Yosemite should honor that. Thank you so much for posting all this info! How would you compare the difficulty of this trail to the JMT? Is it comparable? I would say that Tahoe to Sonora is a little easier–for one thing the elevation is a little lower. 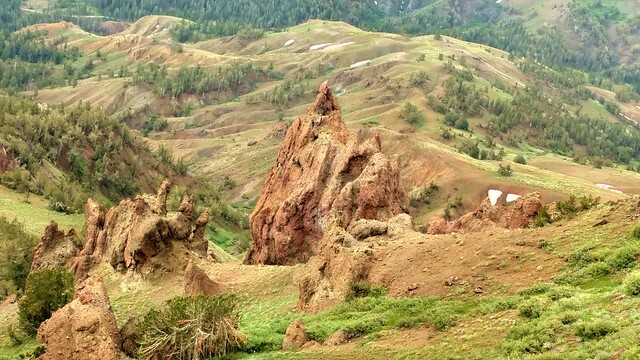 It’s still beautiful but in a different way–more interesting volcanic shapes, tons and tons of wildflowers and many lakes. Sonora to Yosemite was probably harder, especially the washboard section of Yosemite. We had a lot of snow fields to cross in a big snow year which added to the challenge near Sonora. Planning the Trip to the north in July of 19 , with my Llama looking for good grazing and water, permits all in order, will not have stop to resupply,the llama is slow but the trail is patient.. Finally I found a succinct description of the trail, permit info, resupply etc. Thanks Inga! !